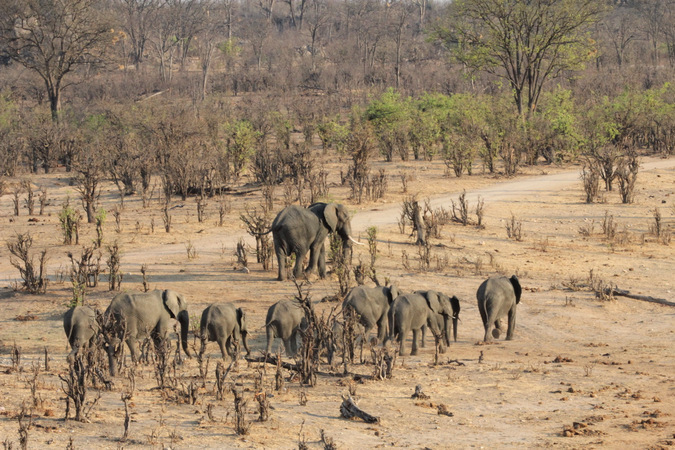 The main motivation put forward for killing elephants in Hwange National Park in Zimbabwe is the argument that they destroy the plants, and this is accepted by many as a problem. Let’s discuss whether this argument has any validity, and whether this argument for culling is really more about sourcing more ivory for the ivory trade, or to justify higher quotas for nearby hunting areas. Let us look at the argument that pumped waterholes or permanent water is stimulating elephant damage of the parks vegetation in a ‘catastrophic’ manner, and that it is a man-made problem that now needs a man-made solution, and that culling is a necessity. 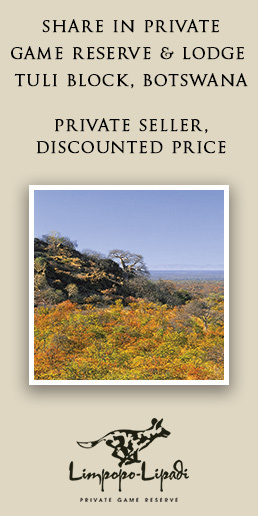 In Hwange there are a variety of habitats and vegetation types, with only a limited number of waterholes. In the dry season the elephants are normally found drinking at these, so there are huge areas of the park at this time with no elephants. So even if damage was done to areas with pumped water, the other areas have no problem. Now let us look at the areas with pumped water. Some open areas near water are vlei lines, or calcrete soils, which would have few trees in any case – with pumped water or not, and with elephants or none. So one should not confuse these open areas with elephant damage. Now even if you do have elephant damage around a waterhole there can be benefits to grazing animals as grass grows better in open areas. 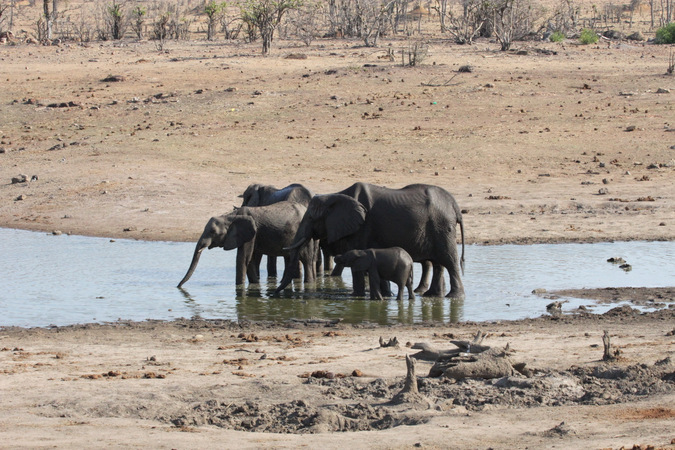 Research in Hwange has found that soils near waterholes are heavily fertilised by elephants, and this benefits many smaller and unnoticed plants in the rainy season. Normally a pan has a natural open area that has few trees, and only at a certain distance from there will you get the tree line. Damage to the tree line is dependent on the species, depth of soil and distance from the pan, but if you come back in say, 10 years, you will see almost the same picture you saw before. So if we work on an average of 100 metres we can try and work out the zone of realistic damage, if there is any. 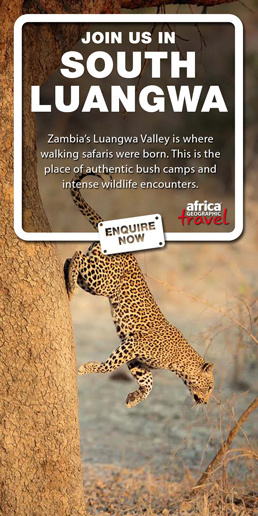 In reality it would be a ring as there are few trees naturally occurring by the waterholes. In some cases if there is a vlei, the tree line may be so far that tree damage is not even an issue. In some places, trees like camelthorns, mopanes and the combretum families can be heavily pruned, but seem to survive anyway – although to the uneducated person it might look bad. So for just the rough calculations on the 14,600 sq km park, I will use 75 waterholes as an example, many of which have no tree damage. Assuming a ring of 100m around each waterhole, this equates to an area of roughly 7,800 square meters for each waterhole. Times this by 75 we get 585,000 square meters (or 0.585 sq km). This equates to a very small figure of potential elephant damage. Even if we double that to one square kilometre, this equates to roughly 0.0068% of the park that might suffer tree damage from elephants. So, to be sure you understand my calculation and logic, less than 1% of Hwange vegetation has been potentially damaged by elephants. And there are questions as to whether this is in fact damage, as there are benefits to the ecology of having highly trampled and impacted areas. Looking at the number of plant species stretching from Hwange up to the Victoria Falls, the last number I got was 1,334 species. Even the best botanist and guides know only a small portion of these, and you will notice much of the research on elephant damage is concentrated only on a couple of species of trees that are not even endangered inside or outside of Hwange. No one pays attention to the ecology of many of these other plants. Someone might argue that there is a possibility that some plants might be endangered and that elephants are a threat to them. Well, let us look at endemic plants in the area (some may just be subspecies). These include Aristida brainii, Danthiopsis petiolata, Euphorbia fortissima, and Jamesbrittenia zambesica, all in the rocky gorges below Victoria Falls, far away from Hwange and in an area unlikely to be impacted by elephants. There is a grass called Eragrostis glischra that is found in mopane woodland, rocky places and Kalahari sand in the north and west of Zimbabwe, and possibly in Hwange. Elephants are not a problem for this grass, and its range extends well out of the park and into areas closer towards Kariba. So we can see there are no endemic plants threatened by elephant numbers in Hwange and up to the Zambezi. 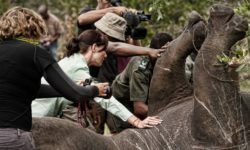 Bearing in mind that elephants are large animals and many people who visit the park are not used to the sort of damage present in all bushveld ecosystems – they being more used to manicured gardens in their neighbourhoods. So broken / fallen trees and heavily pruned bushes can be a shock and appear to be a bigger problem than they really are. 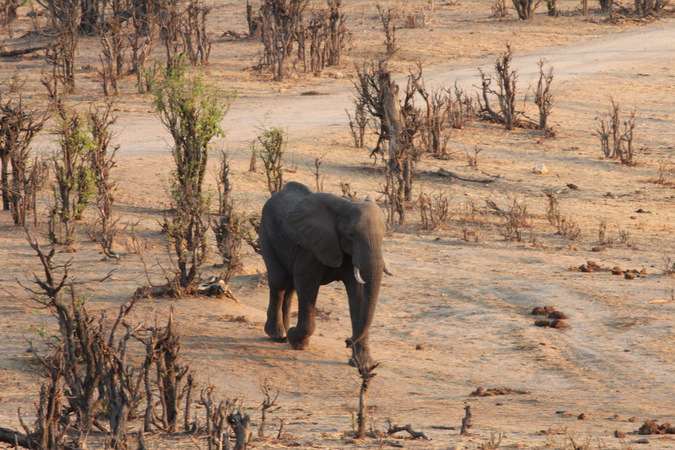 Most studies on elephant damage have concentrated on big tree species such as teak, mopane, combretums, marula and a few other trees near waterholes. The damage measured is normally only measured close to waterholes and little work done miles away. I still remember helping Zimparks years ago on a project which was basically titled “Elephant damage on teak trees”. 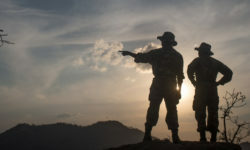 Before the research was started the assumption had been made that the elephants were causing damage to the teak forests, and the research was intended to prove this. One soon saw that they did very little damage, and did not seem to favour these trees for food. So the elephants had a bad rap and the research was launched on a false assumption! 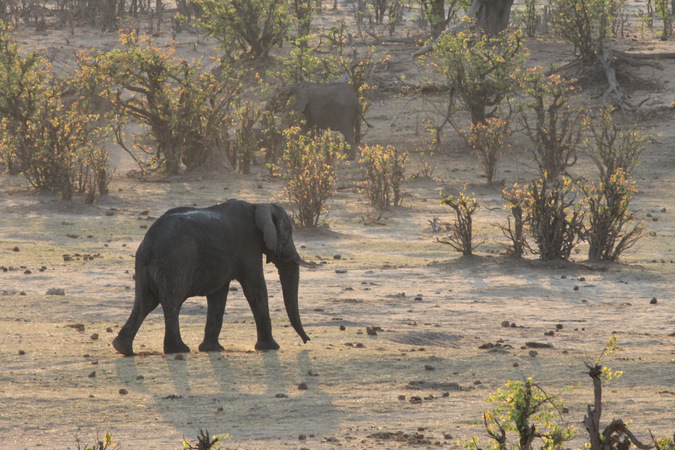 Some researchers have noted little change in the vegetation since the 1960s in Hwange and some areas seem to be more wooded than before. The elephant impact on trees helps stop bush fire damage, fertilises the soil, and spreads seeds etc. 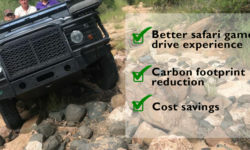 – so tree impact has its ecological benefits. A good example is the spread of camelthorn trees and ilala palms. A very interesting example of seed dispersal is a large albida tree at Ngamo, no doubt brought there from 20 plus or so kilometres away by elephants and the seeds germinating in elephant dung. So in conclusion, in my opinion elephants are not a problem for Hwange’s vegetation and this should not be used as an excuse for any culling in the park. 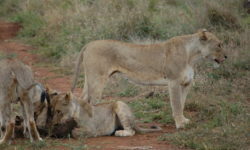 I would also encourage those who visit Hwange to go not only in the dry season to see how well the areas around the waterholes recover during the rains, as dry season visits can give an unrealistic desert experience, in which the casual visitor can get a distorted view of the real situation on the ground. I believe all those who push for the culling of elephants in Hwange should be punished with a 24-hour game count in February or in the rainy season, and in their report list all the small plant species that are around the waterhole. Hopefully they won’t die of boredom or sleep due to there being no elephants around at that time of year!